Ravenna is by no means a large city, but it is home to an amazing eight UNESCO World Heritage sites. Most of these sites are within walking distance of each other. 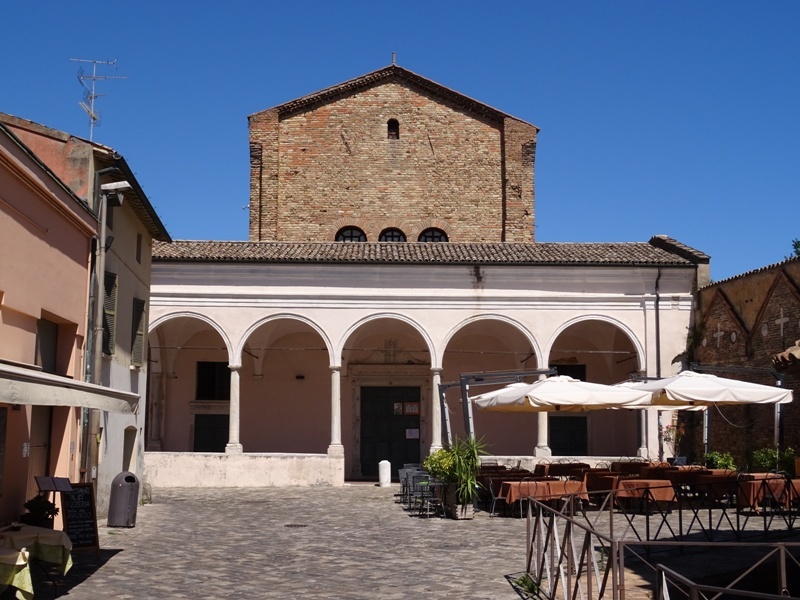 Combination tickets give access to the monuments at very reasonable prices, and admission to two of Ravenna’s most interesting museums is included. 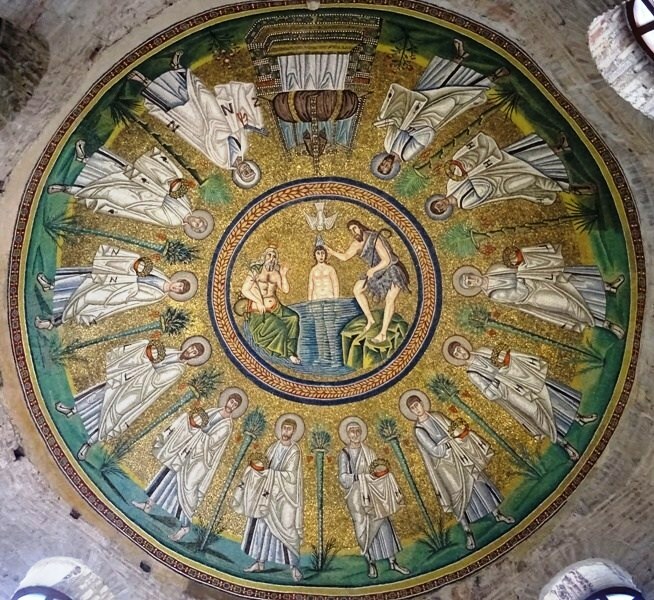 One UNESCO Heritage Site can be entered for free: the Arian Baptistery, which is located a little to the north of the Sant’Apollinare Nuovo. Despite the fact that you do not have to pay for a ticket, this interesting monument does not seem to draw hordes of tourists. We were the only visitors when we entered the Arian Baptistery in June of 2016. The octagonal Arian Baptistery was built after the year 500 during the reign of the Ostrogothic king Theoderic (493-526). 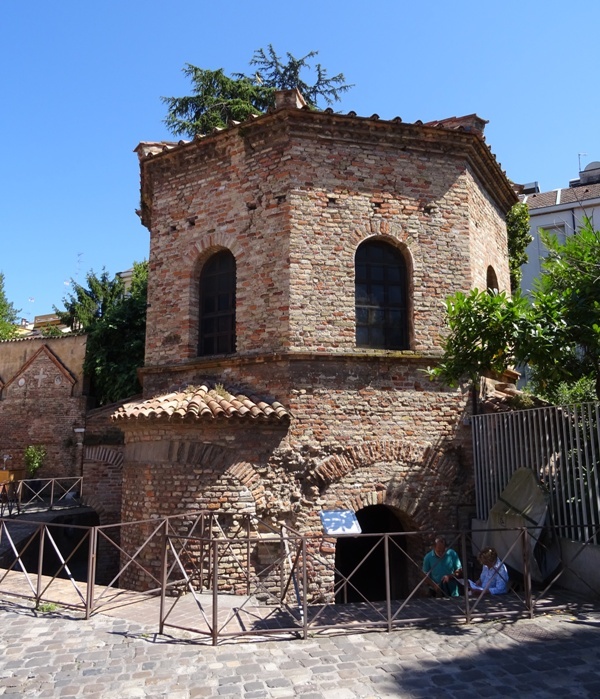 It is therefore much younger than the Orthodox Baptistery next to the cathedral, which is decades older. The Arian Baptistery was also connected to a cathedral, in this case the Arian cathedral of Ravenna. This cathedral was dedicated to the Anastasis, the resurrection of Christ. After its rededication to Orthodoxy, it was dedicated to Saint Theodore, and it is currently known as the Santo Spirito, a name it received in the fifteenth century. The Santo Spirito, the former Arian cathedral. The dimensions of the building are somewhat unusual and it is much smaller than the Basilica Ursiana, the Orthodox cathedral. It measures just 28.3 by 18.5 metres, while the Ursiana was 60 by 35 metres. Of course the Ostrogoths were a minority in Ravenna and did not need a particularly large place of worship, but the somewhat square shape of the Arian cathedral is still remarkable. Unfortunately, the Santo Spirito is no longer open to the public. It is now administered by a community of Romanian Orthodox monks who do not allow visitors. German Wikipedia has a good article about the church, as well as a collection of pictures. Both the earlier baptistery and its mosaic decorations seem to have inspired the people who built the Arian baptistery. The latter building is much smaller though. Its diameter is little over half of that of the Orthodox Baptistery and it is also somewhat lower. The Arian baptistery must have been lavishly decorated once, much like its Orthodox counterpart. However, only the ceiling mosaics have stood the test of time. None of the other mosaics in the building have survived, and neither have the stucco works and the decorations made of painted imitation marble. We know they existed once, as tesserae and other fragments have been found. The religious beliefs of Arian Christians have been discussed in previous posts about Ravenna and they need not be repeated here. Historians and archaeologists have been looking for clues of Arian doctrine in the surviving ceiling mosaics, yet no convincing evidence has been found and it is quite unlikely that it ever will be. The decorations in the Baptistery, which were probably all done before the building was rededicated to Orthodoxy in the 560s, were not found to be offensive to Orthodox worshippers, and so they cannot have contained blatantly Arian messages. Although restoration work was carried out in the seventeenth and mid-nineteenth century, this did not involve altering the original iconography. What we see today is what people would have seen in Theoderic’s days. If the mosaics do contain references to Arian theology, these are not obvious. There are, however, obvious differences with the imagery of the Orthodox Baptistery, which I will discuss below. At the centre of the ceiling mosaics is a medallion featuring a young Christ in the middle and John the Baptist and the personification of the river Jordan to his left and right. Christ is immersed in the water up to his hips. He is naked and beardless, and the dove of the Holy Spirit is above him. Water seems to flow from the bird’s beak. John the Baptist, clad in his camel hair tunic, has his hand on Christ’s head and is holding a shepherd’s staff. The river Jordan is an old man, with red horns on his head and wearing a long green loincloth. There are a few conspicuous differences between these mosaics and the mosaics in the Orthodox Baptistery. Some of the differences can be attributed to changes made to the latter by the Roman mosaicist Felice Kibel (1814-1872) in the nineteenth century (the Christ in the Orthodox Baptistery may have been beardless too, for instance, and the paten there is certainly a later addition). 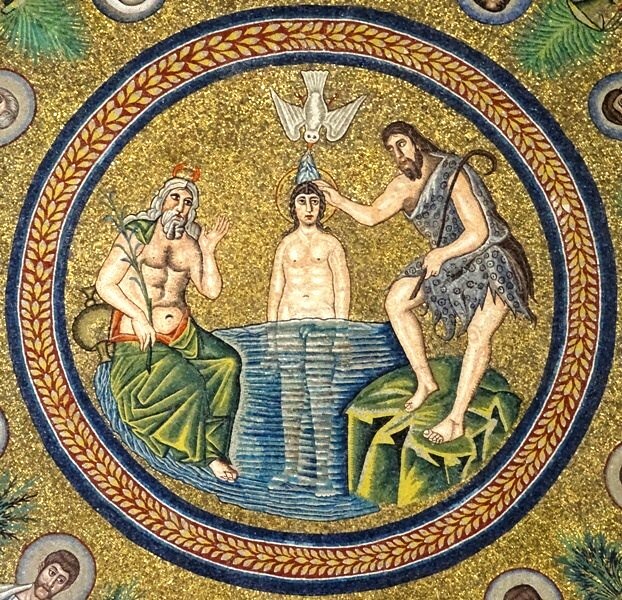 However, the most striking difference is that the baptismal scene in this baptistery is the mirror image of that in the Orthodox Baptistery: the personification of the river Jordan and John the Baptist have switched places. 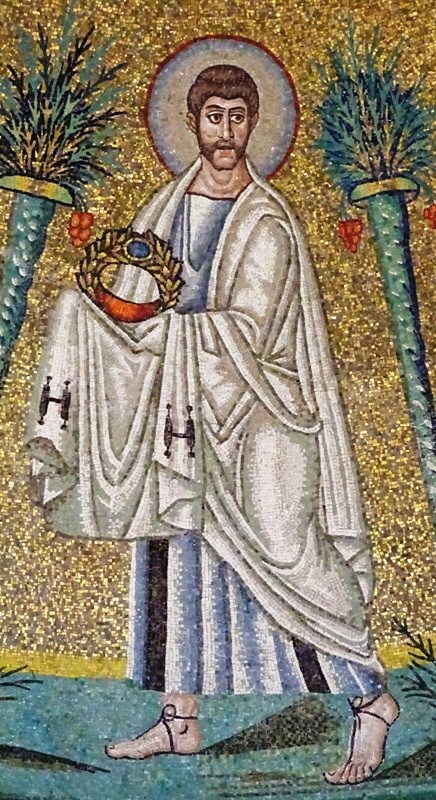 Furthermore, the personification of the river Jordan is depicted much smaller in the Orthodox Baptistery, while he is a full-sized figure here. Whether these differences have any – theological – meaning is up for debate, but it seems unlikely that such a debate will lead to firm conclusions. A second mosaic zone surrounds the central medallion. Here we see Saints Peter and Paul each leading a procession of five apostles to a jewelled cross with a garment draped over it, positioned on a throne. This is known as the hetoimasia and is probably a reference to Christ’s second coming. Peter and Paul are easily recognisable, and so is Andreas, the apostle behind Peter. A difference with the apostles in the Orthodox Baptistery is that the latter are labelled and these are not. 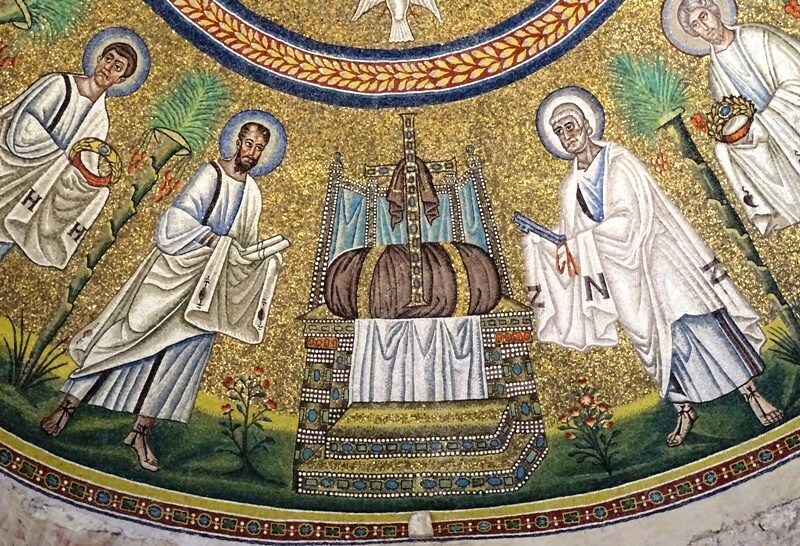 Furthermore, while the ten followers are carrying crowns like their counterparts in the Orthodox Baptistery, Peter and Paul are respectively holding keys and a scroll in their hands. However, the most striking difference is the orientation of the procession. In the Orthodox Baptistery, Peter and Paul are below the baptismal scene, while here, they are both above this scene and upside down. Again, this unusual composition has sparked a lot of academic debate: did the mosaicists simply “get it wrong” or does it have a specific meaning? The discussion is too detailed to summarise here; I refer interested readers to Deborah Mauskopf Deliyannis’ superb Ravenna in Late Antiquity (see below). Mauskopf Deliyannis has pointed out that one of the apostles has so-called “(friendly) mutton chops”, that is, a moustache connected to sideburns, but without a beard. For a good modern-day example see this image of the late Ian “Lemmy” Kilmister, frontman of Motörhead. Mutton chops and moustaches in general were unfamiliar in Late Antiquity and definitely not Roman or Italian. Certainly moustaches were sported by the Ostrogoths, and Mauskopf Deliyannis argues that this apostle was added “to make the point that Goths were part of the Christian community” (in Ostrogothic Italy). This explanation certainly makes sense and I see no reason to reject it. One combination ticket gives access to the Sant’Apollinare in Classe, the Mausoleum of Theoderic and the Museo Nazionale di Ravenna. The other gives access to the San Vitale, the Mausoleum of Galla Placidia, the Orthodox Baptistery, the Cappella Arcivescovile, the Museo Arcivescovile and the Sant’Apollinare Nuovo.